Authentic Pizza Ingredients When we talk about the Italy, what we solely recall is Pizza. Centuries passed by, yet Pizza is most popular & lovable dish preferred by all over the World. And what makes it popular is the Ingredients used to prepare the finger licking pizza. We all have come across the pizza which either have authentic ingredient serving superior quality or the pizza with inferior taste. 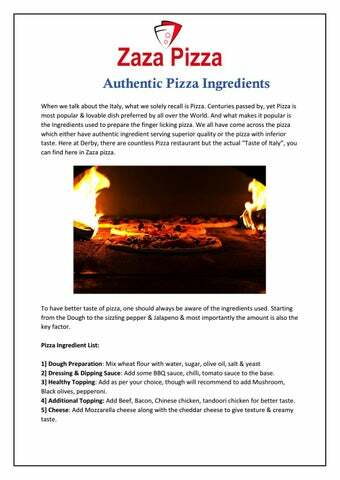 Here at Derby, there are countless Pizza restaurant but the actual â&#x20AC;&#x153;Taste of Italyâ&#x20AC;?, you can find here in Zaza pizza. To have better taste of pizza, one should always be aware of the ingredients used. Starting from the Dough to the sizzling pepper & Jalapeno & most importantly the amount is also the key factor. Pizza Ingredient List: 1] Dough Preparation: Mix wheat flour with water, sugar, olive oil, salt & yeast 2] Dressing & Dipping Sauce: Add some BBQ sauce, chilli, tomato sauce to the base. 3] Healthy Topping: Add as per your choice, though will recommend to add Mushroom, Black olives, pepperoni. 4] Additional Topping: Add Beef, Bacon, Chinese chicken, tandoori chicken for better taste. 5] Cheese: Add Mozzarella cheese along with the cheddar cheese to give texture & creamy taste. 6] Leave in the oven for 5-7min, until the Pizza topping & base is baked properly. Last but not the least add some oregano & flakes for better taste. 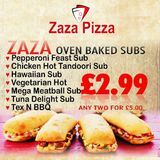 You Can have all the above without making an extra effort at affordable price in your locality by ordering online from http://zazapizzaonline.com, or ask for the takeaway for your preferred pizza & enjoy supper meal from the best Pizza delivery outlet across Derby. Apart from the Pizza, Zazapizza also have varieties of meals like Kebabs, Fried chicken etc.